CCM Tacks 9060 Youth Hockey Skates | Sports Etc. QUARTER PACKAGE: Our all-new MetaFrame technology is an ergonomic boot shaping system providing the best fit for this segment. CORE: SpeedCore 1 Stiffness is a lightweight, rigid and thermo-formable material that helps generate excellent performance. LINER: HD Micro Fiber with Durazone abrasion protection. Offers high resistance to wear, while providing comfort and durability. 7mm felt with embossed lace-bite protection. Reinforced layers for increased comfort and protection. OUTSOLE: Concave Reinforced injection with Exhaust System. A rigid design that helps provide an easier energy transfer. FOOTBED: Anatomical response provides support and comfort. HOLDER: SB 4.0 provides proven durability with increased attack angle for greater strides and cornering. RUNNER: Our SB Stainless provides a long-lasting edge for long-term performance. The new Tacks 9060 skate features MetaFrame Quarter Package Technology, the SpeedCore 1 Core and all the comfort and support you need in a youth hockey skate. 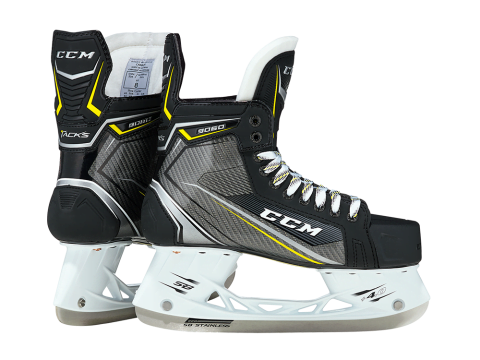 CCM Tacks Fit– Cut wide in the toe and more contoured around the heel. Tacks are perfect for someone with a normal cut foot, who is looking for a more contoured shape around the foot. Similar fit to the Bauer Supreme. Sports Etc Performance To Value Rating– 9 out of 10- A great choice for any youth hockey player in need of a supportive performing boot.